This is a delicious Thai style street food that is eaten at all times of the day. You will love this flavorful dish and unique flavor. I found some baby bok choy, which I thought was so cute, so I had to buy it and use it in this dish. Instead of using the typical egg for the fried rice, I used a flax egg made with 1 tablespoon of ground flax seed and 3 tablespoons water. It worked perfectly. If you want to spice this dish up a bit, just add another red chili pepper. 1.) Make my Perfect Brown Rice recipe below. While brown rice is cooking prepare rest of meal. 2.) Heat oil in a wok or large frying pan. Add the garlic and cook on medium until lightly golden. Watch carefully so you do not burn garlic. 3.) Add the red chili peppers, cashew nuts and toasted coconut. Mix together stevia, Nama Shoyu and apple cider vinegar together. Cook over medium heat for 1 minutes. 4.) Push stir-fry to one side of pan and add flax on opposite end. Cook and stir the flax egg for about a minute and then incorporate into stir-fry mixture. 5.) 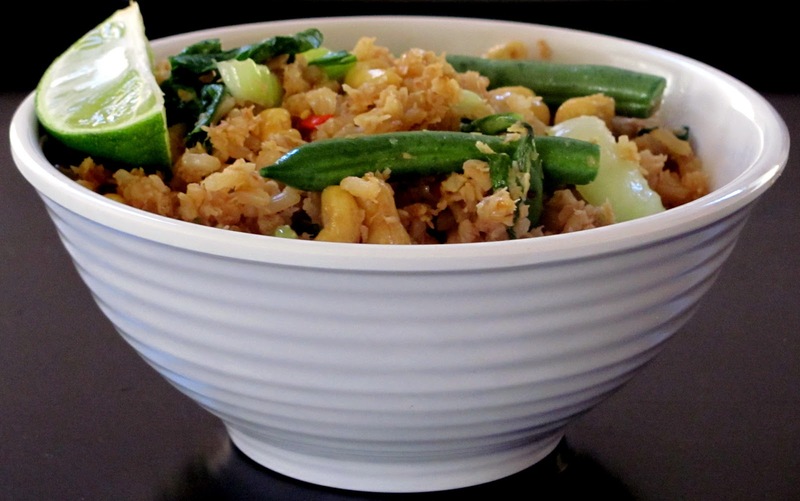 Add the green beans, bok choy and brown rice to stir-fry. Cook and stir on medium for another minute. Bok Choy will be wilted, but green beans will still be a bit crunchy. 6.) Spoon into serving dish and add lime wedge on side for squeezing over rice. 1. Fix brown rice by cooking in 1 tsp. olive oil until lightly browned. Place 2 basil leaves on top of rice and add 2 cups water all at once. Quickly put on lid and bring to boil. Turn down heat to simmer until all water has evaporated (around 40 minutes). Gorgeous photos! That looks so tasty. YUMMY! Looks awesome and delicious!!! That looks amazing! I have to try the flax seed egg. I love brown rice! Bay leafs must give such a great taste to brown rice! I was talking to my daughter on the phone and was telling her about your Thai Savory Brown Fried Rice and my mouth started watering. I'm one of the lucky ones that got to try the original product. Yeah for me! Debbie -- this looks so good! I love Thai flavors but have never tried cooking with them. I am inspired! Thanks! You're really on a spicy foods kick. Never knew you could use flax as an egg substitute in fried rice! It's been a zillion years since I've had it. Thank you ladies for all your comments! I must give the flax egg a try. I've seen that before used in baking but never in a recipe like this. Great idea! The dish looks delicious! Is the flax egg used as a binder? Or as to mock scrambled eggs? That looks so yummy!! Your photos are stunning too!